As Hurricanes Sandy and Katrina have taught us, climate change is a global process with very localized impacts that can profoundly affect community health and quality of life. These localized impacts, ranging from extreme temperatures to rising sea levels, will disproportionately affect vulnerable populations such as the elderly, renters, low-income residents, limited English speakers, those with pre-existing medical conditions, and those without health or home insurance. Yet the same communities considered most vulnerable to climate change also contain a wealth of knowledge about how to creatively marshal social networks, culturally-based practices and skills, and limited resources to weather hard times. Our Community Resilience Fact Sheets, below, can be used by community leaders and residents to learn more about the actions they can take before, during, and after climate change impacts hit. They provide residents with tips and resources on how to better prepare for and protect themselves and their communities from climate change impacts from flooding, rising electricity costs, poor air quality, wildfires, rising water costs and water scarcity, and extreme heat. The fact sheets are part of the Climate Change Survivor project, which provides engaging activities and games, downloadable, to raise awareness about climate change impacts like heat waves, flooding, and poor air quality – and the tools that community members can use to build safety and resilience. The Community Resilience Fact Sheets are the result of a partnership between the Pacific Institute and the Oakland Climate Action Coalition (OCAC) to assess local climate change impacts, vulnerability, and adaptation options — and to develop actionable tools to engage vulnerable communities in climate adaptation planning efforts with a focus on implementation of the City of Oakland’s Energy and Climate Action Plan. Our Resilient Roots Project, a partnership between the Pacific Institute and OCAC’s Resilience and Adaptation Subcommittee, works to connect Oakland residents to the resources and capacity they need to take individual and collective action to build their resiliency to local climate impacts and to engage in climate adaptation planning efforts to better prepare and protect their communities from these impacts. Popular education is a key tool for expanding climate change literacy among vulnerable populations and for engaging vulnerable communities in building community resilience. 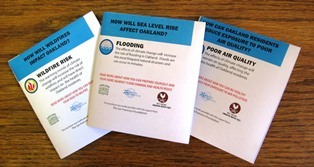 Over the past year the Pacific Institute has worked with OCAC members to develop community-friendly educational materials and activities based on our recently published report Community-Based Climate Adaptation Planning: Case Study of Oakland, CA, which analyzes social vulnerability to local climate change impacts in Oakland and identifies adaptation options that could be put in place to address these impacts. The resulting Fact Sheets can be read as online versions or downloaded to print out and fold into handy brochures. Note: Instructions for folding the fact sheets are included with each fact sheet. For more information about our Resilient Roots Project, please contact Program Co-Director Catalina Garzon at cgarzon (at) pacinst.org.